Prepare for SMART Marketing with this Goal-Setting Excel Template. Have you determined SMART marketing goals for your month, quarter or year? SMART stands for Specific, Measurable, Attainable, Relevant, and Time-bound. SMART is a methodology that helps you establish concrete and achievable marketing goals. They help you focus and prioritize. 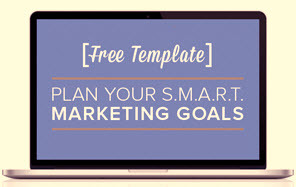 Start creating your new SMART marketing goals with this free template by filling out the form!